MOPS is a non-denominational Christian organization. You do not need to be a church goer to join MOPS. We welcome women from all faith or non-faith backgrounds and beliefs. 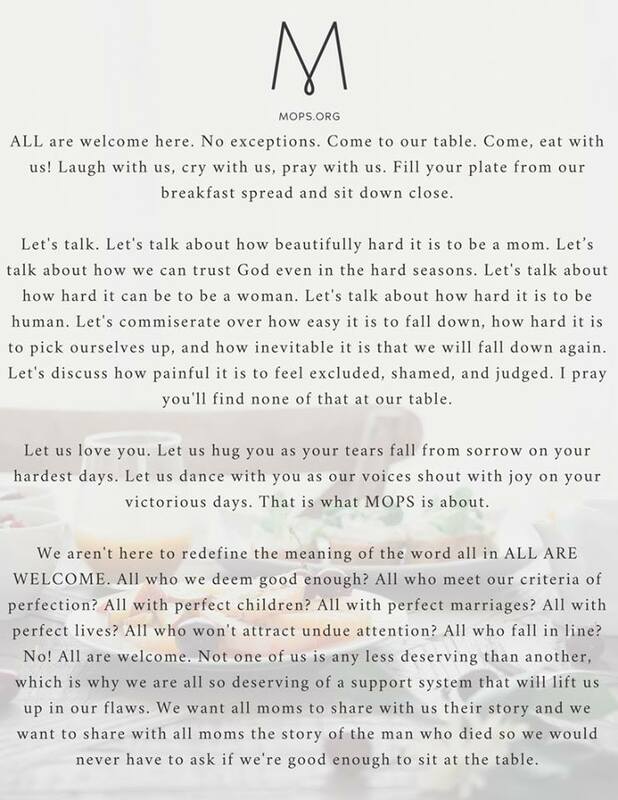 The vision of MOPS is so see no mom alone - because better moms make a better world. If you are a first time mom or a "seasoned" mom, we want to extend a very warm welcome to you. Our hope is that you will find encouragement, support, relevant teaching, and opportunities to develop relationships with other women who are in your same season of life. We are confident that as you become more involved in our group, you will be better equipped to face the challenges that motherhood has to offer. ​We've all been placed in this time and place in history as a tribe of women who are raising the world. We know we mother better together. ﻿What do we do at a MOPS Meeting? A MOPS meeting includes practical teaching through speakers, demonstrations and videos. Sometimes we get a little crafty... sometimes a little crazy... we always have fun! Plus, there is food and coffee, which you can enjoy while it is still hot. MOPS mornings are often the only opportunity our moms have to sit and eat without kids. Need a little mom connection? Stong coffee and a moment to sit still? We do, too. We're here for you. Can I attend a MOPS group before joining? Yes, moms can visit Our Father’s Lutheran Church MOPS before joining. Your first meeting is FREE! Please come and check us out! How do I register? Where do I park/go for MOPS meetings? Please see our OFLC MOPS webpage. Registration can be found at the bottom of the page. You can park at the main entrance of Our Father’s Lutheran Church located on the North side of the building. Meetings are held in the fellowship hall immediately inside the doors on your right. What is the MOPS registration fee used for? This fee includes expenses for the MOPS International membership and benefit package, OFLC MOPS crafts, hospitality and speakers, as well as the OFLC Kids program. Scholarships are available to assist with the MOPS membership dues. Please contact one of our co-coordinators and they can go over the form with you and answer any questions. Who brings all the food to the MOPS meeting? Each MOPS member is expected to prepare and bring breakfast items (egg dish, pastry, fruit or other items). Please help us make MOPS great by participating. Every mom is assigned to a table. This assignment allows you to get to know the other mother’s at your table well and creates a support network. Each table will be assigned 2 meetings to bring food to once each semester. If you will miss the meeting your table is assigned to bring food you are responsible to make arrangements for those items to be brought and letting your table leader know. ​ There are also meetings where the table leaders or mentor moms treat us too. Coffee, Creamer, and Juice is provided by OFLC MOPS. Can I advertise my business at the MOPS meetings? My son/daughter is sick this morning, but I could really use a break. Can I still come? We would love to have you come to the meeting, but would ask that you find alternate childcare for your child in order to attend. One thing we should remember is that we need to be considerate of other children. Although missing a meeting is a bummer, bringing a sick child to the nursery will expose many other children to your child's illness. ​Please see the MOPS Handbook for more detailed information. On average how many women attend the Friday morning meeting? We have about 41 registered women in our MOPS group. Typically we have 75-90% of our members present. Of course! Our motto is NO MOM ALONE! Our goal is to make sure no mother accepts the challenge of motherhood alone -- It's a place to make instant connections and friends and we welcome everyone with open arms!